This past year was a chaotic one for international affairs. With a civil war raging in Ukraine, a bloody burst of violence in Israel-Palestine and the rise of the Islamic State in Iraq, territorial disputes have made the world less peaceful than it has been any time in the last seven years. But while many of these disputes may seem ideological or purely political, the battle that defined 2014 wasn&apos;t simply over land or bodies of water, but over access to resources and power. If you want to understand the news headlines that held the world&apos;s attention in 2014, follow the lines on these maps. If there&apos;s a logic to the sad, chaotic story that is modern Iraq, it could be traced along the oil pipelines that wind like veins across the country ravaged by civil war and foreign invasions. As the map above shows, northern Iraq became the primary oil producing nexus of the country after the 2003 U.S.-led invasion opened business for foreign oil companies like Chevron, Genel and Exxon Mobil. Now, an estimated 5 billion barrels of oil reserves beneath the desert sands are open to other businessmen: the militant group Islamic State. IS took its current form around 2006, but it wasn&apos;t until recently that the terrorist group became a threat to global security with a spate of beheadings and mass atrocities, all of which have been funded by the group&apos;s stranglehold on key, lucrative oil fields. In June, IS seized vast swathes of territory in northern Iraq and hijacked profitable oil fields and pipelines. The group is likely generating $1 million each day, and the profits help fund the group&apos;s operations: Five hundred dollars a month for a fighter and about $1,200 for a military commander. Six months after the militants took control of the oil pipelines, IS is still earning money to fund attacks and other operations. It adds up to "several million dollars per week from the sale of stolen and smuggled energy resources," warned David Cohen, the undersecretary for terrorism and financial intelligence at the U.S. Department of Treasury, the Guardian reported. Since August, U.S.-led airstrikes have bombarded IS tankers and refineries, but have done little to put a dent in a black market trade pouring into Turkey, Iran and Jordan. 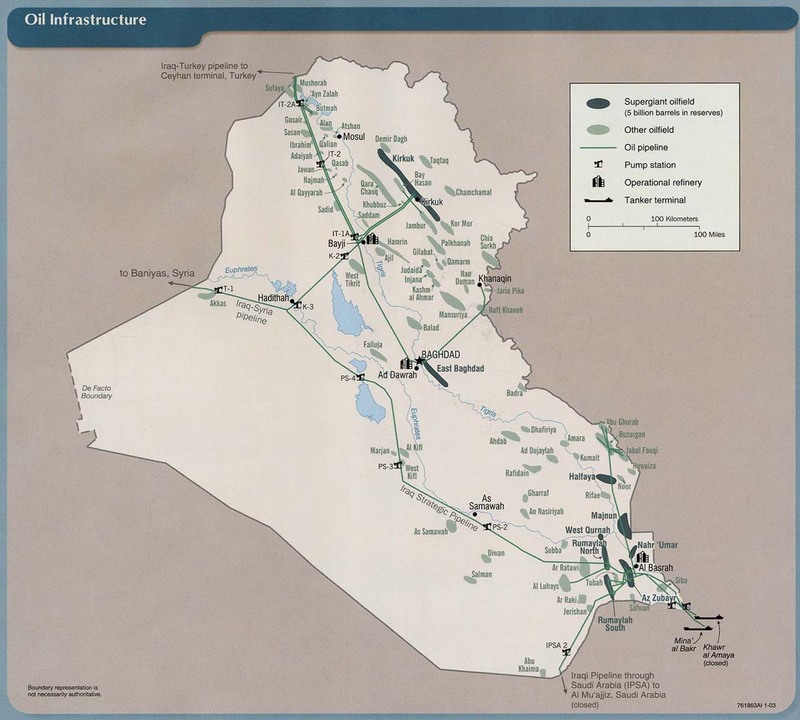 As bombs rain down on strategic cities of Syria and Iraq (the U.S.-led coalition recently conducted 55 airstrikes in the region), the pipelines snaking across Iraq will continue to pump money into a metastasizing conflict. Russia made a lot of big diplomatic bets in 2014, mostly at the expense of its neighbor, Ukraine. The Russian military annexed Ukraine&apos;s Crimean Peninsula following a referendum in March and shut off natural gas pipelines across the country. To say the least, relations between Kiev and the Kremlin have been strained since protesters forced Ukrainian President Viktor Yanukovych to flee the country. The Kremlin saw Yanukovych&apos;s ouster as a window of opportunity to invade Ukraine, sparking a yet unresolved armed conflict between the Ukrainian military and pro-Russian fighters inside Ukraine. But Russia&apos;s attempt at expansion isn&apos;t simply about supporting Yanukovych or gaining more land. Rekindling Cold War mentality was one way to further control Ukraine&apos;s vast gas transportation network. As the map illustrates, this network of pipelines blanket Ukraine from east to west and is a gateway to the European market. The gas network controlled by Russia also helps Moscow keep a firm grip on former Soviet states, Moldova and Georgia. And the European market is hesitant to apply sanctions or restrictions on Russia because many countries are largely dependent on its steady supply of energy. The European Union receives about a third of its natural gas from Russia. The Kremlin is now trying to find other routes to bypass Ukraine and reduce its reliance of energy transit in the country. On Tuesday, Russia abandoned a decision to build the South Stream pipeline, which would bypass Ukraine&apos;s transportation network, because it was too expensive, Reuters reported. Despite risking economic downturn, Moscow still plans to circumvent Ukrainian networks by cozying up to Turkey in a proposal to build an undersea pipeline, a diplomatic maneuver with major repercussions beyond 2014. For much of 2014, China, Taiwan, Japan, Vietnam, the Philippines, Malaysia and Brunei have been embroiled in a tug-of-war for control of islands and rocky shoals that dot the vast South China Sea. But what might seem like a race to occupy islands and secure trading routes is actually a calculated battle over precious underwater resources. The region contains approximately 11 billion barrels of oil and 190 trillion cubic feet of natural gas in probable reserves, according to the U.S. Energy Information Administration. At the current price of $77 for a barrel of oil, the region presents both energy security and a profitable future for the country in control. Chartered expeditions and shipping vessels are the only modes of transportation across the vast, remote South China Sea, which stretches from Singapore in the southwest to Taiwan in the northeast. Three chains of islands have become major flashpoints for the growing dispute: the islands known by China as the Diaoyu and by Japan as Senkaku, the Spratly and Paracel islands. The risk of conflict between nations embroiled in the dispute is significant. A Chinese water cannon could go too far in repelling other countries&apos; boats or increasing joint military drills between the Philippines and United States may send the wrong message to the Chinese military. Land is sacred. For one corner of the Middle East, in Israel and Palestine, land is not just holy, but an essential tool of to political power; it represents the building blocks of statehood and national identity for both Israelis and Palestinians. For international observers, the Israeli settlements, like the massive concrete barrier separating the West Bank from Israelis living in occupied territory, are an obstacle to peace.The settlements, writes former British Ambassador Oliver Miles, serves "to prevent the creation of a viable Palestinian state alongside Israel: the two-state solution." "For some Israelis, and a good many settlers, that is precisely the point," said Miles. "Settlements are deliberately located and expanded to prevent any future Israeli government offering anything resembling a viable Palestinian state." Simmering tensions rooted in previous Israeli settlements in Gaza and other disputed territories in the West Bank reached a boiling point in 2014, exploding into violent conflict after three Israelis were kidnapped and burned to death in June. The death of the teenagers became a justification for the largest appropriation of Palestinian land in the West Bank by Israel in 30 years, sparking armed conflict in Gaza. It was one of the bloodiest in recent memory: A damning report published in November by the human rights organization Amnesty International points to war crimes perpetrated by Israeli airstrikes in July and August on Palestinian homes in Gaza. In an ultra-Orthodox neighborhood of West Jerusalem, two Palestinian men armed with a gun and meat cleavers stormed a synagogue on Nov. 18, killing four men in the middle of morning prayers. It is arguable that both sides are equally responsible for the thousands of civilians, the majority of them Palestinians, who have died because of decades-long conflict. The settlements will only exacerbate things. Policymakers supporting the two-state solution and international lawyers point to article 49 of the fourth Geneva Convention adopted in 1949: "The Occupying Power shall not deport or transfer parts of its own civilian population into the territory it occupies." "Israel, it appears, has no more right to build settlements than the U.K. or the U.S. would have had to build British or American settlements in Iraq after the 2003 war," Miles writes. The U.S. State Department spokesman, Edgar Vasquez, answering a question on Nov. 3 about Israel&apos;s approval to build 500 homes on disputed land, captured the U.S. stance. The settlements, Vasquez said, are an unfortunate step that prejudges the future of the disputed holy land.